The scenario that led to the emergence of Senator Bukola Saraki as Senate President in 2015 is likely to repeat itself again in the 9th senate. The crack within the APC Senators-elect seems to be widening over the choice of Ahmed Lawan to be the next Senate president, a decision that did not augur well with some of the Senators in the party. Dissatisfied with the decision of the party, Senator Ali Ndume insist to contest for the position of the Senate President. Orji Uzor Kalu, former governor of Abia state and Senator-elect under the platform of the APC, has also said that the decision of the APC to deny the South - East of producing the deputy senate president could force him to challenge Lawan. 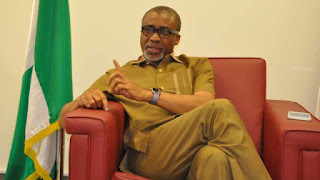 Reacting to the power tussle within the APC Senators-elect, Senator Abaribe said the PDP members 'are simply watching the APC as they continue to make a fool of themselves'. He said that the PDP members votes is intact and they would vote for the candidate of their choice as a group on the day of inauguration. He said, “The PDP leadership had not met yet to decide our position. We are simply watching the APC as they continue to make a fool of themselves. We still have enough time to reach a consensus on what to do.